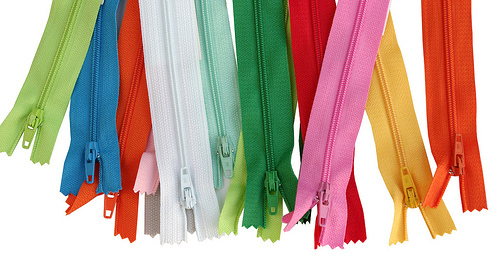 These colorful zippers came home with me in a spur of the moment decision to finally overcome my fear of sewing with zippers as well as to make a few stocking fillers for Christmas. I've had a go at making zippered pouches once before although I felt that some further refinement of my skills was needed. And so it began. These three pouches were my first attempt. I searched the Internet for zippered pouch tutorials (and there are lots!) and found this tutorial by Noodlehead to be particularly easy to follow and had success making these pouches without difficulty. I then decided that I wanted to try my hand at a pouch with zippered tabs and used Colleen's (The Busy Bean's) tutorial found here: Basic Pouch with Zippered Tabs to get started. I have fiddled around with size and also found a more suitable interfacing (iron on) product at my local store, GJ's Discount Fabrics. (I have only used interfacing for the exterior fabrics). 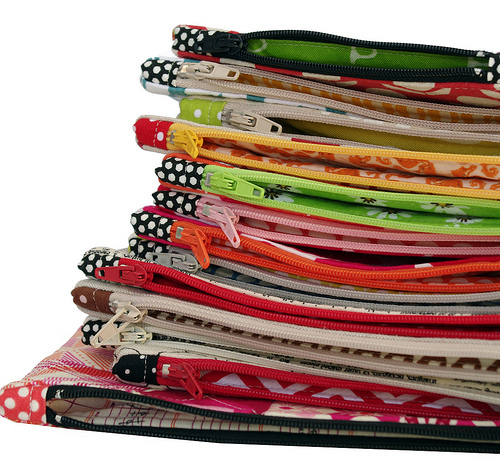 All of the zippered pouched have been lined with quilting cottons. 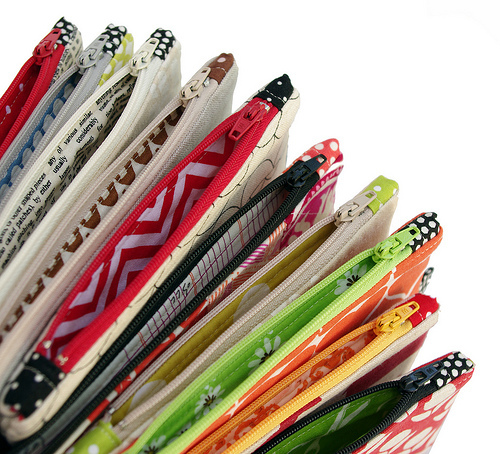 Choosing zippers and fabrics has of course been the most fun! And I've also moved on to making patchwork pouches; this one featuring fabrics from the Notting Hill collection by Joel Dewberry, a gift for my young niece filled with pink and orange pens, pencils and markers. I have lined the exterior patchwork fabric with iron-on interfacing rather than batting, then quilted it. Ah yes, you can see what some of my family and friends will be receiving in their Christmas stockings this year. There's plenty to go around, and I think they make an unique and thoughtful handmade gift. Good times. A fear of zippers conquered, and gifts ready for wrapping. 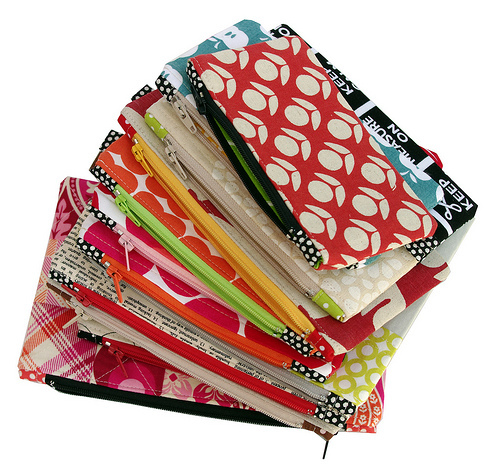 These are great- you combine the best fabrics! I have such a hard time picturing you being afraid of anything sewing related. I'm glad you moved on and pushed through it though. So glad you overcame the zipper fear! 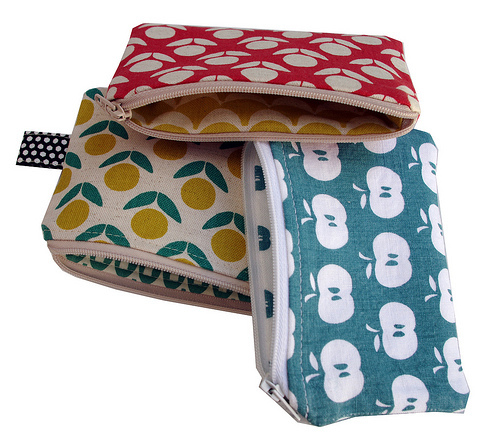 I love them - and pouches make such a fun and quick project to sew. Glad my tutorial could help you out. All of your pouches look amazing. What lucky friends you have. Everyone that receives one will be thrilled. Thank you! I am a beginner and the second thing I have ever made is a zip top makeup bag with french seams. I know, I'm mad! I was having a hard time getting the seams close to the zip neat but these little tabs look so much neater. Yours look super-cute - your choices of fabric is always so stylish! What fun Rita! I don't think these will get done before Christmas but I am going to tackle them in the quiet week between Christmas and New Years. hanks for the hints on tutorials! Love these and I love putting in zippers so I feel some totes coming on! 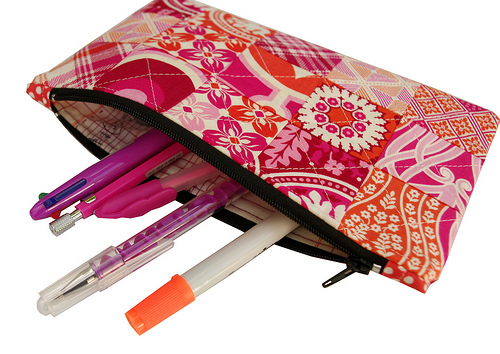 I have been wanting to make zippered pouches the last few days and knew there were a slew of tutorials out there. Thank you for doing the work of parin it down to a couple of good ones for me. :) Your pouches look beautiful. I long for Echino prints and now have a great idea for how to use them. Merry Christmas!! They're just so cute! I wish I could get past my fear of zippers. Glad you're loving zippers now. :) pouches are just so fun. Wow..just like that! Love those owls! Zipper pouches are my favorite thing! I love all of yours! OK-back to the machine for me, too. Thanks for the impetus and inspiration too. Happy Holidays to all your family. Such fun zip bags! I love to give those to friends as well. Yes, they are very lovely and thoughtful gifts. The color and pattern combinations are dazzling! You did a great job! Zip bags are so fun to make and very useful! Love them all! Thanks for the links, something for me to try! These are gorgeous - would love one! I need a replacement to fit my credit cards etc. Great job! Do you have any information on the blue apple fabric print? Ya totally rocked it, Rita! Your friends and relatives are going to love those beauties! What a great idea! I need to make some of these. I'll be following the links you listed. Those are SO pretty!! And the tab is so "Rita". How perfect! I'd love one - will you be selling any online? These are beautiful! I really like how you combined different colors of zippers with the zipper tabs. My sewing machine refuses to sew over zipper teeth, so I was glad to see that you nestled your tabs close to, but not over the teeth. I will be giving this a try. Thanks for sharing! 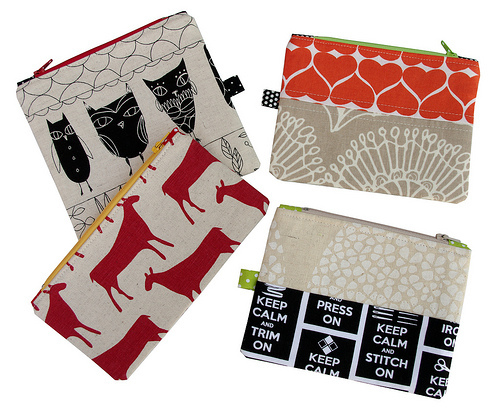 Hi I am also wondering if you will be selling any pouches online? I love all of your fabric choices. Its fun to see them all together and all the fun colors! I don't know if my messages are coming through or not because I posted yesterday. 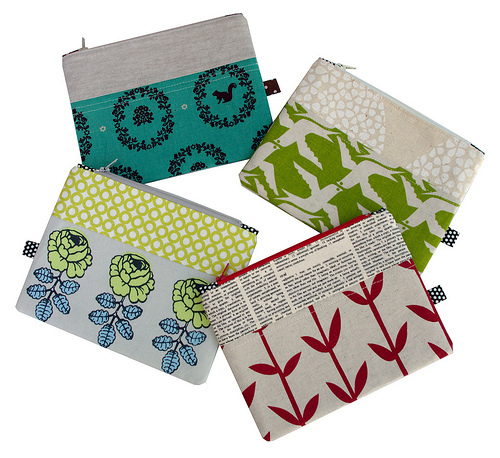 Can you PLEASE tell me how you get the beautiful white backgrounds of the zippered pouches. I have been trying to figure this out for so long and have read so many tutorials and spent so much money to get that look. I may be interested in some of those fabrics, but first I need to figure out the white background technique. Do you use a particular camera setting, use some type of photo light tent box, or use a software program or a combination of both? I thank you in advance for the answer. Hello - I am receiving your messages but I can't reply to personally as you are a no reply account. If you send me an email - redpepperquilts at gmail dot com - I'll be able to reply to you.